PLEASE NOTE: To the fullest extent permitted at law, except as expressly provided herein, all moneys paid as part of a registration to sit the HPAT – Ireland test are non-refundable. PLEASE NOTE: Registration fees for the HPAT – Ireland 2019 test will be refunded without charge if requested within 14 days of your registration date. After that period an administration charge of €45 will be deducted. Refund requests for HPAT – Ireland 2019 have closed. Refund requests must have been submitted before 1 February 2019 at 5.15pm GMT, unless otherwise allowed by law. Requests must be submitted online through your account and a confirmation email will be sent to your registered email address if your request has been successfully submitted. 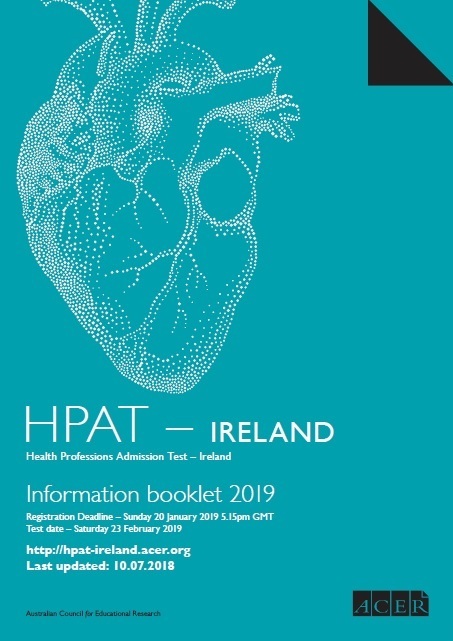 Please note that access to any preparation materials included with the HPAT – Ireland 2019 registration will be withdrawn upon completion of the refund. The fee will be refunded to the credit card used for payment. Online by credit card (Mastercard, Visa Credit and Visa Debit). From the date your registration for HPAT – Ireland is accepted and your results finalised and forwarded. This should should occur within a period of six months of you sitting of the HPAT – Ireland test. Any digital content in respect of HPAT will be provided in PDF format readily accessible by commercially available software. If you have any questions or complaints about the goods and/or services you purchased, please contact us. You have a right to cancel your contract within 14 days without giving any reason. To exercise the right to cancel, you must request a refund through your online HPAT – Ireland account. For sale of goods, the cancellation period will expire after 14 days from the day on which you acquire physical possession of the goods supplied, unless this right has been waved. For services, the cancellation period will expire after 14 days from the day of the conclusion of the contract (i.e. when ACER accepts your registration). If you cancel your contract, ACER will reimburse to you all payments received from you, including the costs of delivery (except for the supplementary costs arising if you choose a type of delivery other than the least expensive type of standard delivery offered by us). ACER may make a deduction from the reimbursement for loss in value of any goods supplied, if the loss is the result of unnecessary handling by you. if there were no goods supplied, 14 days after the day on which ACER is informed about your decision to cancel this contract. ACER will make the reimbursement using the same means of payment as you used for the initial transaction, unless you have expressly agreed otherwise; in any event, you will not incur any fees as a result of the reimbursement. We may withhold reimbursement until we have received the goods back or you have supplied evidence of having sent back the goods, whichever is earlier. You shall send back the goods or hand them over to ACER, without undue delay and in any event not later than 14 days from the day on which you communicate your cancellation from this contract to ACER. The deadline is met if you send back the goods before the period of 14 days has expired. If you request to begin the performance of services during the cancellation period you shall pay us an amount which is in proportion to what has been performed until you have communicated us your cancellation from this contract, in comparison with the full coverage of the contract (this applies only where the request to cancel the services is made before they have been fully performed). Should you agree to immediate performance of the purchase contract in respect of goods you may lose your right to the 14 day termination period.